I seem to remember in "Grease" during the girls' sleepover one of them was standing on the bed, mimicking this jingle. Bucky Beaver was portrayed by Jimmie Dodd, who wrote the brusha, brusha, brusha song. 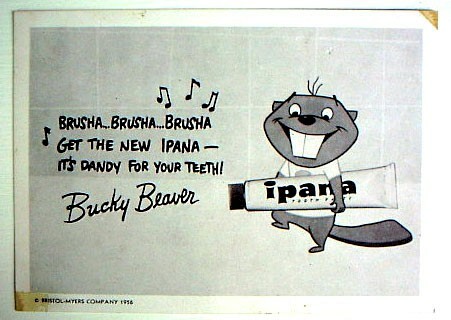 "Brusha Brusha Brusha New Ipana toothpaste"
We used this for years and it appears in the movie "Blast from the Past"
According to Wikipedia, the Bucky Beaver character was created by Disney artists.